Brent and I are fans of Thai food and especially chicken satay which is chicken pieces dipped in peanut sauce. Yum. 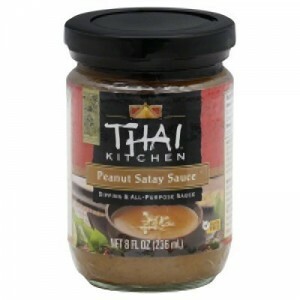 I finally found a peanut sauce - Thai Kitchen Peanut Satay Sauce -- that tastes authentic. Or at least it's as authentic as we're used to. Here is the recipe for curry seasoned chicken to go with the peanut sauce. Stir together all ingredients, but the chicken. Keep stirring until sugar is dissolved. Toss chicken in the sauce mixture, cover and marinate for 2 hours. After marinating, push 3 - 4 chicken pieces on each skewer. The pieces can be grilled for just a couple minutes each side or baked in the oven for 10-15 minutes. Serve with warmed peanut sauce and rice. I baked mine in the oven on a jelly roll pan lined with parchment paper. Next time I might use foil to keep the pan cleaner. Our 13 year old enjoyed the dinner right with us, but not our 10 year old. This is the second receipe of yours that I ve tried with excellent results! I m new to using crockpots and your recipes make me look like a pro. My family likes a lot of sauce so I doubled-up those ingredients and the meal was delicious and perfect! I’m so glad you had good results. We just tried this recipe again tonight and may have liked it even more the second time around. We’re having good weather right now so we grilled the skewers of chicken. Yummy! We just made the satay again last week and gobbled up every bite. Wish we’d made more.